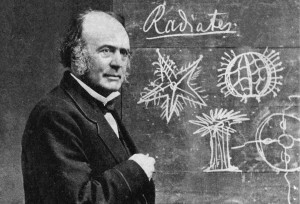 Swissborn Agassiz immigrated to the United States in 1846 and became professor of natural history at the Lawrence Scientific School of Harvard University. One of the great scientists of the 19th century, Agassiz established a museum of comparative zoology at Harvard and opened the field of ecology to generations of scientists. His teaching method, radical in its day, emphasized personal contact with nature rather than instruction from books and lectures. Posted on June 14, 2016 by Natalie. This entry was posted in Scientists. Bookmark the permalink.